Numerous governors have celebrated or prioritized Career Technical Education (CTE) during their annual State of the State Addresses to their state legislatures this year. When outlining their policy agendas for 2019, many governors highlighted successes related to CTE and committed to fostering CTE in their respective states. Governors prioritized expanding access to CTE for learners. In New Hampshire, Governor Chris Sununu announced an $8.6 million allocation to remove barriers, such as tuition and transportation, to CTE participation. In Idaho, Governor Brad Little mentioned that he will focus on expanding CTE opportunities for learners. Meanwhile, in Massachusetts, Governor Charlie Barker celebrated adding 4,000 seats to the state’s vocational and technical schools. In Rhode Island, Governor Gina Raimondo noted that the state increased the number of CTE programs offered in high schools by 60 percent. Both Massachusetts and Rhode Island have prioritized increasing high-quality career pathways under the New Skills for Youth (NSFY) initiative. During the addresses, Governors also emphasized CTE funding in their states. In Maryland, Governor Larry Hogan celebrated voters’ approval of the “casino lockbox initiative,” which will provide $4.4 million in additional funding for innovative CTE programming and other educational initiatives. In North Dakota, Governor Doug Burgum dedicated $40 million in Legacy Fund earnings for career academies. Numerous governors also celebrated work-based learning, particularly the expansion of apprenticeships. In Montana, Governor Steve Bullock highlighted that seven out of 10 two-year colleges in the state offer apprenticeship coursework. In New Jersey, Governor Phil Murphy celebrated the creation of more than 100 new apprenticeship programs that hired more than 2,000 new apprentices. In Pennsylvania, Governor Tom Wolf noted that the state increased the number of apprenticeship programs to roughly 800. In total, more than 20 governors have celebrated or prioritized advancing CTE in their states during their State of the State Addresses. This is Advance CTE’s second blog post on the State of the State Addresses- to view the first blog post click here. Advance CTE will continue to monitor the State of the State Addresses for their relevance to CTE. Aligning systems is one of five key principles of the shared vision, Putting Learner Success First. System alignment can ensure a shared vision and commitment to seamless college and career pathways for every learner; by maximizing resources, reducing inefficiencies and holding systems accountable, every learner can have the supports they need to find success. The recent enactment of the Strengthening Career and Technical Education for the 21st Century Act (Perkins V), the reauthorization of the Carl D. Perkins Career and Technical Education Act (Perkins IV), presents new opportunities to align Career Technical Education (CTE) and state workforce systems to strengthen and expand opportunities for learners. States have taken different approaches to align CTE and the workforce systems, from submitting Workforce Innovation and Opportunity Act (WIOA) combined state plans with Perkins IV as a partner program to establishing strong connections between CTE and the workforce systems via strategic partnerships and plans. As states think about improving the effectiveness of this connection, it’s critical to reflect on and learn from states’ efforts to enhance CTE and workforce system alignment. To inform this post, Advance CTE interviewed several State CTE Directors to learn about how they align CTE and workforce systems in their respective states. Below are key takeaways from those conversations and highlights of a few state examples. While states take different approaches to aligning CTE and workforce systems depending on their needs, some common approaches to aligning CTE and workforce systems emerged. Local advisory boards: Many states leverage local employer advisory boards to inform CTE programs. For instance, Pennsylvania has a state mandate that requires all secondary schools and Perkins recipients to engage local workforce development boards to inform their programming. Shared goals: Other states establish shared strategic targets and goals across the education and workforce systems. In Washington, the Workforce Training and Education Board is responsible for the administration of Perkins and WIOA, which allows the state to easily set goals for Perkins and WIOA that align. Even though Washington does not have a WIOA combined state plan with Perkins IV as a partner program, its state workforce plan has included CTE in its strategy for more than thirty years and state law requires WIOA and Perkins plans to align. As a result, Washington makes it a point to establish Perkins performance goals that align with WIOA goals. Strategic Initiatives: States also align CTE and workforce systems through strategic initiatives. In Oklahoma, the Oklahoma Works initiative aligns resources, education, training and job opportunities to promote workforce development in the state. Through this initiative, Oklahoma examines education, workforce and economic data to ensure that programs of study align with labor market data. Ensuring that CTE programs of study have labor market relevance is a key strategy for aligning CTE and workforce systems. Trend data from Advance CTE surveys since 2005 suggests that coordination between CTE and other state initiatives is more common when there is an external forcing event, such as state or federal legislation that triggers a statewide planning process. As states expand upon or strengthen their work to align CTE and workforce systems, they must consider how they will sustain systems alignment even when these statewide planning processes conclude. Some states, such as West Virginia, established CTE and workforce systems alignment sustainability through building partnership infrastructure. West Virginia has a WIOA combined state plan with Perkins IV as a partner program, which helps to promote collaboration between the CTE and workforce systems. Representatives from the West Virginia Division of Technical, Adult and Institutional Education (WV-CTE) serve on the WIOA State Board and helped to develop the state goals articulated in the WIOA combined state plan. Representatives attend a quarterly WIOA group that meets to ensure that the state is making progress on the goals articulated in its WIOA plan. Additionally, WV-CTE has a Governor’s Economic Initiative office within it that ensures CTE programs of study are aligned to industry needs and developed collaboratively between business, industry and education. West Virginia is able to sustain its CTE and workforce systems alignment through establishing statewide goals via the WIOA combined state plan, clearly defining roles through committees and establishing routine accountability checks. CTE and workforce systems alignment is necessary to ensure that learners are on a path to securing in-demand, high-wage careers. While the state examples in this resource showcase the importance of elevating partnerships and collaboration to achieve alignment, CTE and workforce systems alignment can take many different forms. A state’s approach to CTE and workforce systems alignment should be guided by its state vision, goals and infrastructure. The Every Student Succeeds Act (ESSA) requires states to articulate long-term goals for student academic achievement, graduation rates and English language proficiency. Yet some states have opted to go beyond federal requirements to describe a comprehensive vision for the future of K-12 education. In some cases, this helps anchor the plan and provides opportunities for cohesion across different title programs. As the remaining 34 states prepare for next month’s submission deadline, several — including Pennsylvania and South Dakota — are taking the opportunity to refine their statewide vision. These states are leveraging the ESSA stakeholder engagement and planning process to chart out a new, aspirational future for education, one that puts career readiness front and center. The Pennsylvania Department of Education (PDE), for example, describes its mission as preparing all learners for “meaningful engagement in postsecondary education, in workforce training, in career pathways, and as responsible, involved citizens.” PDE goes on to elevate the importance of career ready pathways for student success. This framing sets the tone for the rest of the state’s proposed ESSA plan, and is echoed through the state’s accountability, technical assistance and grant administration strategies. Under accountability, Pennsylvania calls for a career readiness indicator to measure the implementation and completion of career exploration activities in elementary, middle and high school. Additionally, the state proposes a new public-facing report card called the Future Ready PA Index that will monitor and report out a variety of career readiness metrics. Metrics identified through stakeholder engagement include participation in advanced coursework (Advanced Placement, International Baccalaureate and dual enrollment), and the number of students earning industry-recognized credentials. The inclusion of these metrics in Pennsylvania’s public reporting and accountability system demonstrates the state’s commitment to career preparation at all levels of education. The plan also identifies funding sources through different ESSA title programs and outlines strategies to braid funds and promote certain career preparation activities. These strategies are organized around four guiding priorities, one of which is to ensure well-rounded, rigorous and personalized learning for all students. Specifically, the plan proposes to increase participation in advanced coursework, promote access to Science, Technology, Engineering and Math education (STEM), and support meaningful career pathways, aiming to increase enrollment in state-approved CTE programs by five percent annually. With this clearly articulated vision, PDE urges local education agencies to braid funds through Title I, Title II and Title IV to support related efforts. Specific encouraged activities include hiring and training qualified career and college counselors to help learners make informed decisions about their career paths. Similarly, preparing all graduating high school student for postsecondary education and the workforce is one of four K-12 milestones identified in South Dakota’s ESSA plan. The importance of CTE and career preparation is not lost. In fact, South Dakota commits to providing learners with multiple pathways to demonstrate readiness for college, career and life after high school. Like Pennsylvania, South Dakota plans to use its accountability system to achieve this vision. The state aims to refine it college and career readiness indicator, originally adopted in the 2012-13 school year, to value learners who graduate ready for both college and careers. The indicator includes two metrics — assessment of readiness and progress toward a post high school credential — that count students completing advanced coursework such as CTE, AP and dual credit as well as those earning passing scores on college entrance examinations. What is notable about South Dakota’s ESSA plan is that CTE is drawn out as a strategy throughout different parts of the plan, illustrating the extent to which CTE is core to South Dakota’s vision. For one, South Dakota plans to provide technical assistance to schools identified for comprehensive or targeted support and improvement to help them develop and expand high-quality CTE pathways. The justification for this strategy is that CTE students have higher graduation rates. Additionally, South Dakota aims to launch pilot schools that provide work-based learning experience, early postsecondary opportunities and robust career guidance and supports for students. And, under Title IV, Part A (the new Student Support and Academic Enrichment Grants), South Dakota plans to set aside state funds to help local education agencies expand high-quality CTE pathways. ESSA gives states a clear opening to reorganize their priorities and vision for K-12 education. Newfound flexibility under the law allows for state-appropriate strategies that reflect stakeholder input and are aligned with other statewide initiatives. However, ESSA plans will only be as effective as states make them. By setting clear goals and connecting efforts and strategies, states can organize their ESSA implementation efforts to support career readiness and success. Long after the tassels are turned, the podiums are packed away, and the diplomas framed and positioned on the wall, state policymakers are hard at work devising new policies to help the next class of high school students graduate career ready. Whether through career readiness expectations, Career Technical Education (CTE) graduation endorsements or alternative CTE graduation pathways, helping learners build the skills they need to be successful in their future careers is a priority for policymakers in Illinois, Missouri and Pennsylvania. In Illinois, a new Postsecondary and Career Expectations (PaCE) framework comes on the heels of 2016’s Postsecondary and Workforce Readiness Act. That legislation, designed to enhance the Illinois education system to better prepare learners for college and the workforce, adopted a number of strategies including a competency-based learning pilot, college and career pathway endorsements, and supports for educators and district leaders. Specifically, the law directed the Illinois State Board of Education and other state agencies to identify expectations for students between grades 8 through 12 to be prepared for success after high school. Under the law, these expectations would need to focus on career exploration and development; postsecondary institution exploration, preparation and selection; and financial aid and financial literacy. 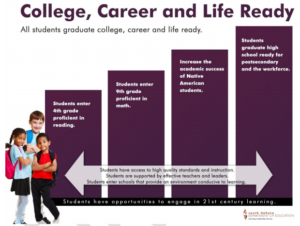 Earlier this month, the Illinois State Board of Education formally released the newly-developed PaCE framework, outlining guidelines for college- and career-focused activities at each grade level. 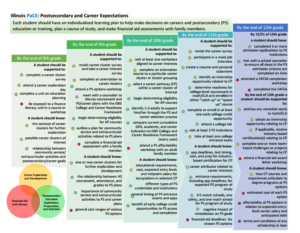 Many expectations are aligned to a student’s self-identified career pathway. By the end of 10th grade, for example, students are expected to participate in a mock interview, create a sample resume, and identify an internship opportunity related to their career pathway. However, career exploration is emphasized in earlier grades through Career ClusterⓇ interest surveys and career exploration days. Though use of the framework is voluntary, it is designed to empower local educators and administrators to better target supports to students to ensure they are on track for success after graduation. Meanwhile, the Missouri State Board of Education outlined requirements for the state’s new CTE graduation certificate. The certificate program, authorized under 2016’s SB620, is designed to recognize the value add that CTE provides, helping equip students with the technical and employability skills to be more competitive in both college and the workforce. The legislature specifically called on the State Board of Education to work with local school districts to ensure the certificate program does not incentivize tracking, or “separating pupils by academic ability into groups for all subjects or certain classes and curriculum.” Rather, the legislation emphasizes program quality, encouraging local school districts to rely on industry-recognized standards, skills assessments and certificates. In June, the Missouri State Board of Education finalized requirements for a CTE diploma to recognize students who, in addition to completing their core graduation requirements, focus in a CTE area of study. True to the intent of the law, the requirements above all emphasize achievement. Students are only eligible to receive a CTE endorsement if they, among other requirements, maintain a 3.0 GPA in their CTE concentration, earn an industry-recognized credential or a passing score on a technical skills assessment, complete at least 50 hours of work-based learning, and maintain an attendance record of at least 95 percent throughout high school. By prioritizing student success and achievement, Missouri’s CTE diploma requirements appropriately recognize that CTE enhances the traditional high school experience. Finally, CTE students in Pennsylvania will have more flexible pathways to graduation after lawmakers amended a yet-to-be-implemented examination requirement. The change comes in response to a 2014 State Board of Education rule that required students to pass Keystone examinations in Algebra I, Biology and Literature before graduating. Although the requirement was scheduled to apply statewide for the graduating class of 2017, the legislature last year decided to delay implementation to give the Department of Education enough time to identify alternative assessment opportunities for CTE students. Under the original policy, students who failed to pass the Keystone examinations could demonstrate competency through project-based assessments in order to meet graduation requirements. However, with low Keystone pass rates and high participation in the burdensome project-based assessment alternatives, the legislature soon realized that additional options needed to be explored. The new law, HB202, provides CTE concentrators an exemption to the Keystone graduation requirement if they 1) complete grade-based academic requirements and 2) either complete an industry-based certification or demonstrate likelihood of success based on benchmark assessments, course grades and other factors. To meet the industry-based certification requirement, CTE concentrators will be able to choose among state-approved credentials in their area of focus, including National Occupational Competency Testing Institute (NOCTI) and National Institute for Metalworking Skills (NIMS) examinations. While alternative graduation pathways that recognize learners’ career goals help to expand options for high school students, it is important that academic rigor is not the price of flexibility. Graduation requirements should continue to be rigorous and ambitious to ensure all learners are set up for success after graduation, whether they choose to pursue college or careers. The Pennsylvania Department of Education can continue to uphold rigor in CTE programs by ensuring that grade-based academic requirements and selected industry-based certifications are high quality and appropriately reflect the competencies learners need to be successful regardless of their chosen pathway. In May the Texas state legislature passed SB22, establishing a statewide Pathways in Technology Early College High School (P-TECH) program. Starting fall 2017, districts and open enrollment charter schools will be able to apply for startup funding to establish a P-TECH program, which allows learners to graduate in six years with an associate’s degree or two-year postsecondary certificate and work-based learning experience. Minnesota’s omnibus higher education appropriations bill for the 2018-19 biennium established a $1 million Workforce Development Scholarship pilot program and provides funding to develop new concurrent enrollment courses. Vermont passed an economic development bill that, among other things, establishes a Career Pathways Coordinator position within the Agency of Education to serve as a point person for interagency efforts to develop curriculum and design statewide career pathways. Itâ€™s been a while since weâ€™ve brought you an update on relevant research from the field. There’s so much to cover we’ve broken it into two parts. From the New America Foundation, researcher Mary Alice McCarthy challenges the artificial distinction between education and training and calls for â€œupside-down degreesâ€ to reinvent the outdated concept of what the postsecondary education experience can be. McCarthy offers reforms to state and federal education policies to create this flipped paradigm. She also points to states and institutions that are building pathways to four-year degrees that start with a career-training program. Others are developing â€œappliedâ€ bachelorâ€™s degrees to help students build on and extend their technical expertise. The New York Federal Reserve has a report taking a closer look at unemployed college graduates and found that those who major in more technically oriented, occupation-specific fields have much lower underemployment rates than their peers in more general fields. Columbia Universityâ€™s Community College Research Center looks at institutional and state effectiveness in helping students transfer from community college. New from Georgetown Universityâ€™s Center for Education and the Workforce (CEW), you can take advantage of their new State Initiative, which is a portal to help states use data more effectively to inform policy and planning around education and careers. The economic value of college degrees in Pennsylvania as well as a look at the Iowa workforce, where 68 percent of all jobs by 2025 will require postsecondary education and training. The lingering pain of the Great Recession and an examination of how the labor marketâ€™s recovery.